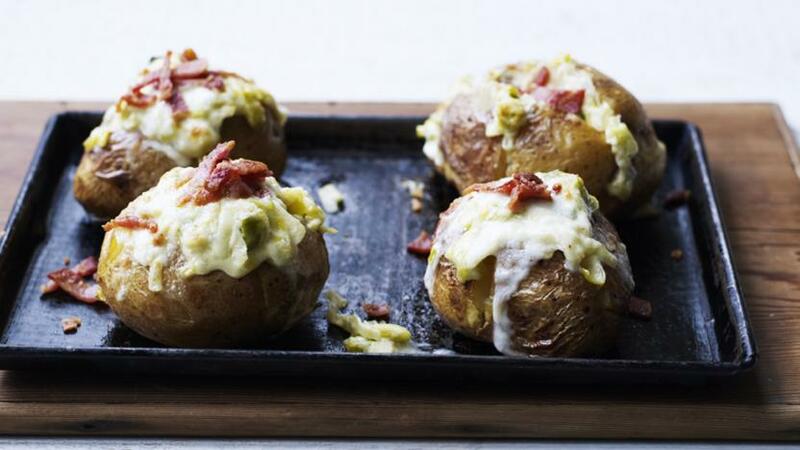 Taleggio melts wonderfully and makes a delicious topping for baked potato, combined here with bacon and a creamy white wine sauce. Rub the potatoes with the olive oil, prick all over with a fork and place onto a little pile of sea salt on a baking tray. Place the potatoes on the top shelf of the oven and bake until tender and the skin is crisp, about an hour. Remove from the oven and set aside until cool enough to handle. Meanwhile, heat a frying pan until medium hot. Add the butter, shallot and garlic and cook for 2-3 minutes, then add the leeks and cook for another two minutes. Add the white wine and cook until the volume of liquid has reduced by half. Add the cream and cook for 3-4 minutes, or until thickened. Season, to taste, with salt and black pepper. When the potatoes are cool enough, cut them into quarters and place into an ovenproof dish. Pour the leek sauce over the top then add the taleggio pieces. Heat a frying pan until hot, add the bacon and cook until golden-brown and crisp. Roughly chop the bacon and scatter it over the top of the cheese. Place in the oven and bake for 10 minutes, or until golden-brown and bubbling.